The Essentials in Magic™ collection gives you the opportunity to enjoy one-on-one instruction from Daryl, the Magician's Magician™. Internationally known and respected as one of the world's finest teachers of magic, Daryl personally mentors you through clear, easy-to-understand video segments and helps you to develop and perfect classic sleight-of-hand skills and techniques, in a way never before available without private lessons. 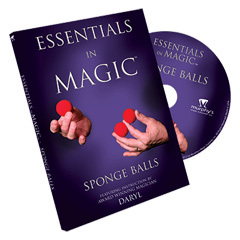 As a World Champion Magician, creator, and teacher of magic, Daryl has distilled decades of experience and study into each DVD to bring you everything you need to know to perform miracles with sponge balls, trick decks, linking rings, cups and balls, and many other classic illusions, right away! Daryl is waiting to share these secrets with you in the Essentials in Magic. This DVD focuses on Sponge Balls, an amazing magic effect, that is easy to do! "For a few brief seconds, I truly felt like a kid being exposed to magic for the first time again. It was beautiful. Both this DVD and the Linking Rings DVD from this series had this effect on me. Long story short, I highly recommend this for just about anyone. "